Reading between the lines it might well be that the Steels became indebted to John Cochran a Blockmaker in Leith and it was he who petitioned for the sequestration of the Steels. It is not known whether the yard was sold as a going concern since there are no other records showing the existence of the yard after 1843. However John Cochran the Blockmaker in Leith who was instrumental in seeking the sequestration of the Steels was himself sequestrated in August of the same year at least suggesting that the moneys which the Steels owed him had not been recovered or at least not sufficiently to stave off his own bankruptcy. William and John Steel continued to live in Elie and they are designed in the census at being firstly Shipbuilders then later after 1843 ships carpenters. 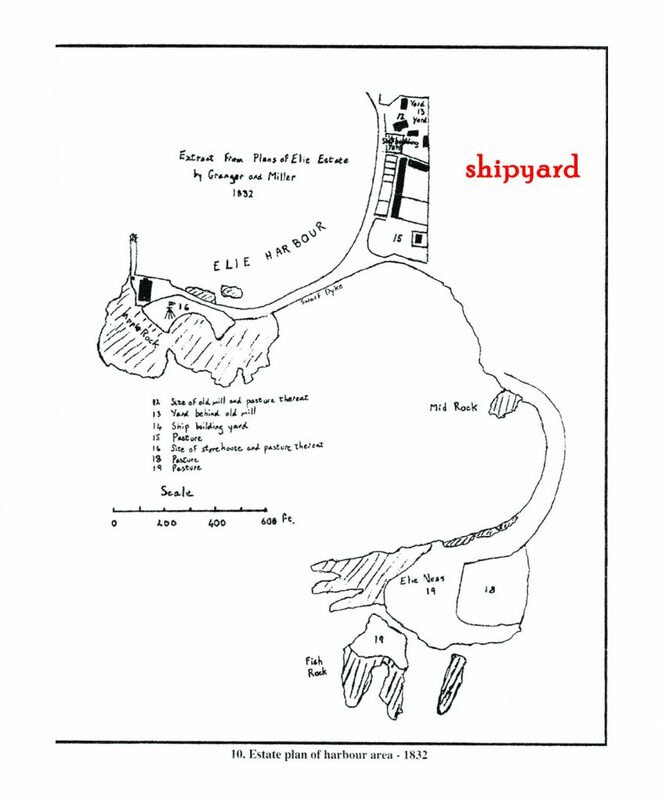 The location of the shipyard is only currently ascertainable by the concrete slipway situated in effect at the bottom of Admiralty Lane and the shipyard itself as can be seen from this map would have occupied the area of ground at the mouth of that lane. 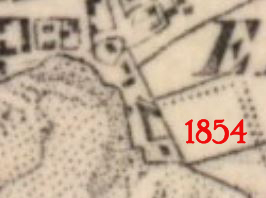 The 1885 ordinance survey shows a building L shaped. 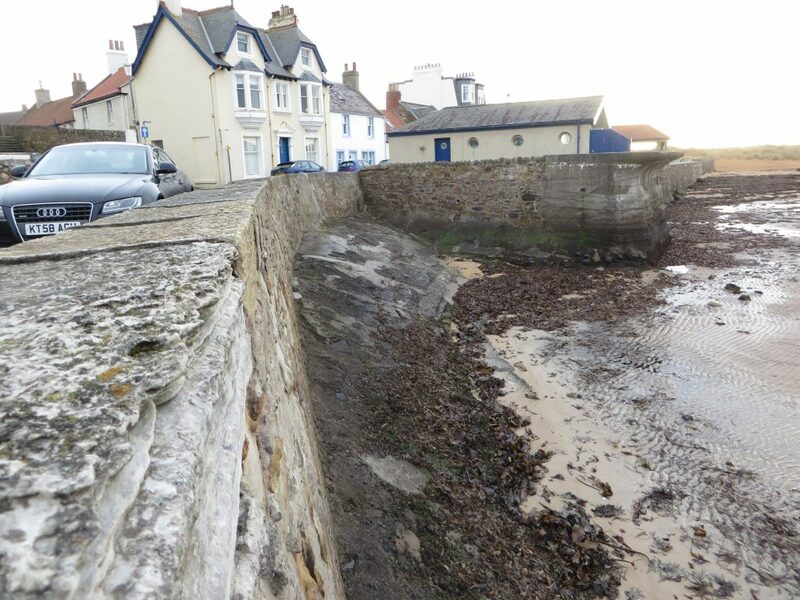 The Toft itself seems to have been realigned when Baird was organising the building of the causeway to the harbour since before that (1853) the roadway would have probably gone behind the shipyard and it would have been realigned when the gardens along the Toft were washed into the sea by erosion – the Toft Wall is a relatively modern ( post 1820) addition. Looking at the area it seems likely that the old road would have gone behind the shipyard and between it and the loom mill thus enabling the shipyard to have a slip way from which boats could be launched into the sea. 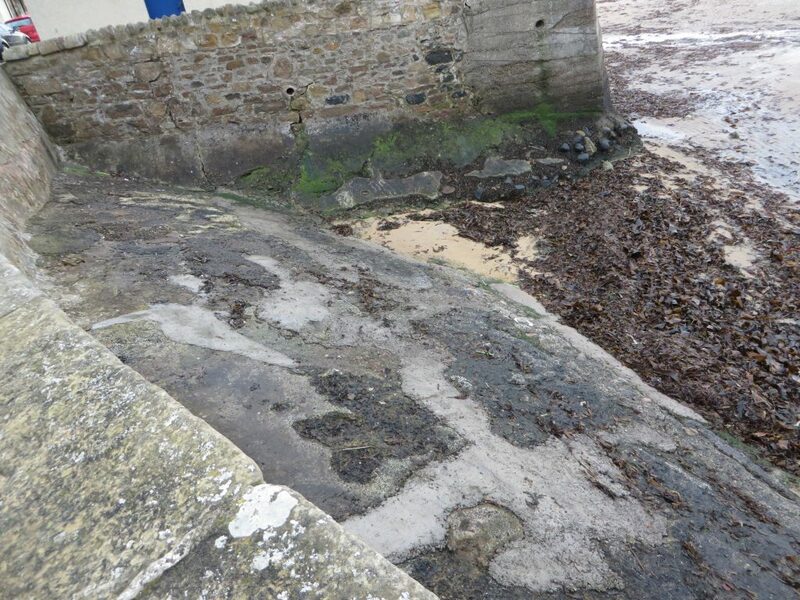 The current location still shows the concrete slipway into the sea and it is possible that the Toft was realigned . 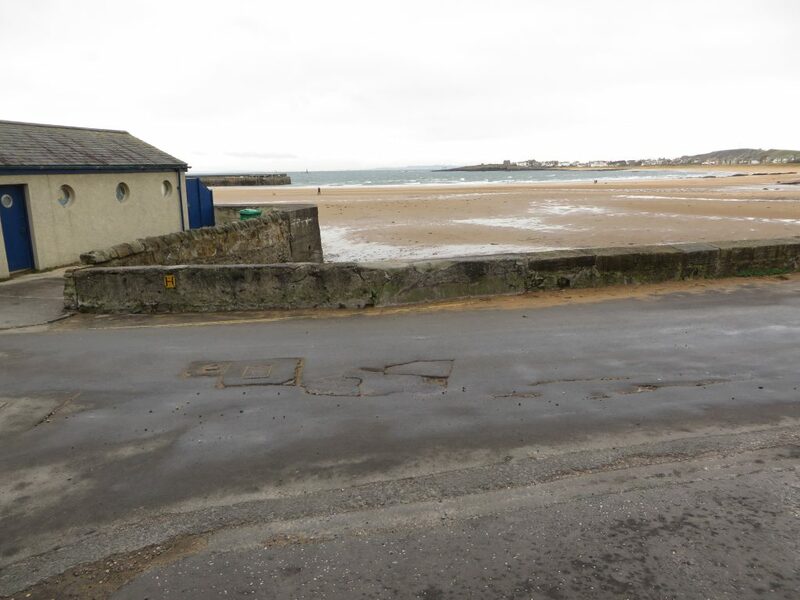 These current pictures show the concrete slipway and the view down from Admiralty Lane. It may be co-incidence but the stone on the Toft wall at this location bears a different construction to that of the rest of the Toft sea wall. 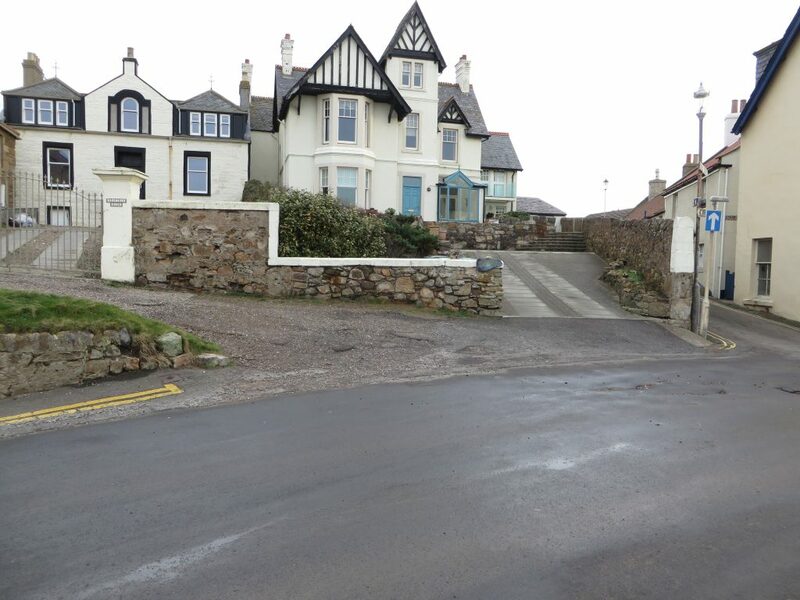 This is unlikely to be as a result of it having been rammed by a vehicle failing to stop in time coming down Admiralty Lane since it is one way – the other way. The Loch run from Kilconquhar Loch which runs under Wadeslea and exits into the Harbour bay just up the road from the shipyard was used to power the Lint Mill which was situated to the north of the shipyard. Its position suggests that it might be the building on the earlier maps rather than the Shipyard which again suggests that the yard was not sold as a going concern and was demolished shortly after 1843. We also know that the first “Pharos”, which operated as a lighthouse vessel from 1799 to 1810, was a simple wooden sloop 49 feet long (approx 15 metres) and 18 feet wide (approx 5½ metres). 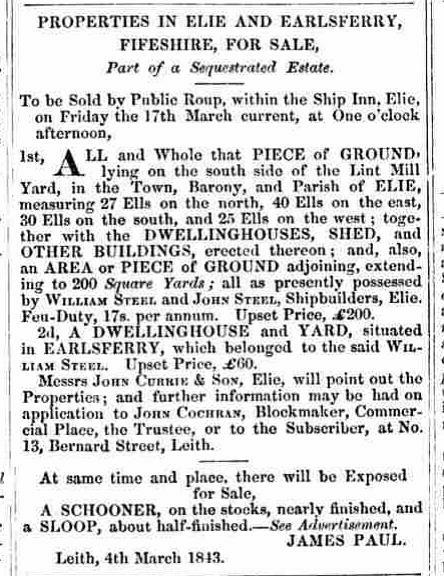 The Steels were not the only shipbuilders to come from Elie. The Calman family were born in Elie but John Calman started building ships in Dundee round about the same time and it is of course possible that they learnt some of their trade from the Steel family business.